Lying on Mallorca’s lesser known east coast, some 70km from Palma airport, is the family orientated resort of Calas de Mallorca. If you’ve previously visited Mallorca and enjoyed stays in some of its flagship resorts such as Magaluf, Puerto Pollensa or Cala Millor be warned that Calas de Mallorca bears little, if any, resemblence to them other than being located on the same Balearic land mass. These premier resorts are packed with restaurants, bars and nightclubs and there are so many things to do that a fortnight’s holiday is barely long enough. Calas de Mallorca on the other hand is a quiet destination tucked away on the island’s east coast. It’s a nice enough place for a relaxed family holiday but won’t have enough to offer many people planning their visit. Whilst there are a few bars around the resort’s ‘Centro Comercial’ you’ll find that most evening entertainment revolves around what your hotel has on offer so be sure to research this before confirming a booking. Anyone who wants nightlife to play a big part in their holiday ought to look elsewhere. If you book a package to Calas de Mallorca with your tour operator you’ll often find that getting thereis a real hassle. After an early rise, hanging around the airport and a flight of over 2½ hours from many northern European destinations the last thing you want is to be stuck on a coach for the best part of two hours. A far better option if you’re happy driving abroad is to rent a car at Palma airport and drive yourself to Calas. Zest Car Rentals come highly recommended for Majorca car hire thanks to their fair pricing and avoidance of all those “dodgy fees” imposed by far too many operators in the holiday car hire market. Having the car during your stay will also prove invaluable in giving you the freedom to explore the whole of Mallorca’s east coast. To get there just head east out of the airport heading for Llucmayor on the Ma-19. Beyond the town of Campos look for signs to Felanitx and the PM-401 to Cales de Mallorca. the map below shows the route from the airport to the resort. It’s quite straightforward as far as Felanitx but keep your eyes peeled for the roadsigns in that last stretch. I know some people still aren’t keen on renting a car abroad in which case I’d strongly recommend that you consider booking a transfer to Calas de Mallorca with Shuttledirect. Their prices are fixed at the time of booking and are competitive with taxi prices so there are no nasty surprises on arrival and if you have any particular requests such as child seats these can be arranged in advance. The limited amount of accommodation in town seems somewhat rundown which is consistent with the resort as a whole. The go to hotel is the Complejo Calas de Mallorca Resort which is probably the best place available for family holidays as part of a package deal. Personally I’d suggest taking a look at some of the partments available such as Valls De Cala Domingos Apartments or Calas Park apartments. Both of these are usually available at good rates on Booking.com. Beaches – To the south of town are two pretty beaches called Cala Domingos and Cala Murada which are worth a visit if you’re in the area. The water at these beaches is lovely and clean but be careful if travelling with small children as there are some currents that need to be respected on this stretch of the coast. You can hop on the “wally trolley” which transfers holidaymakers between the various local beaches. Jumaica Tropical Park – This tropical park is where a Mallorcan family bought some arid land in 1973 only to find it had its own priceless water supply which they’ve used to transform their property into a tropical garden containing many animals. A nice excursion with the kids. Visit Manacor – All over the island you’ll see adverts for “Majorica pearls”, these are made at factories around Manacor which are open to the public. And whilst you’re there keep an eye out for Rafa Nadal as this is his hometown! Visit Felanitx – To experience real Mallorcan life, pay a visit to the inland town of Felanitx. Sunday morning is a good time to go as they have a very good weekly market selling local handicrafts, pottery, fruit and vegetables, etc. Visit Portocolom & Porto Cristo – Well worth visiting along with a number of other destinations along this coast. 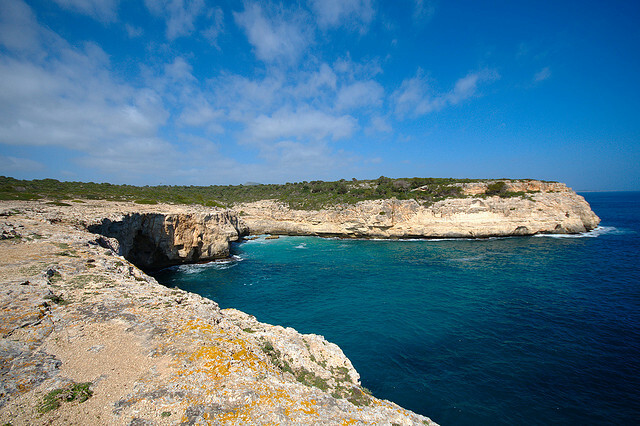 take a look at our article about the East Coast of Mallorca for more information. Anyone who is a regular reader of my newsletter will know that I’m a great fan of Mallorca having lived there for four years when i first moved to Spain. As such it’s very rare that I’ll make negative comments about this beautiful island. 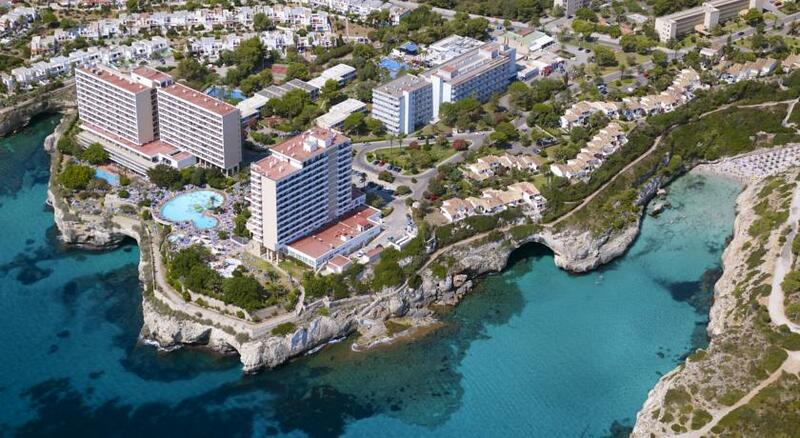 Unfortunately, in the case of Calas de Mallorca I have to make an exception. the pace looked worn out when I first saw it in the late 1980s. Today little has changed. The resort feels as though it’s on its last legs only attracting tourists based on cheap all inclusive deals. Maybe it has some value as a base from which to explore the many attractions of the island’s east coast and its interior but with so little in the way of amenities for tourists I see no real reason to go there when there are so many more attractive options nearby.